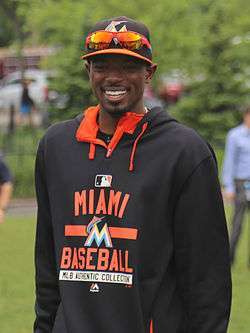 Devaris "Dee" Gordon (born April 22, 1988) is an American professional baseball second baseman for the Miami Marlins of Major League Baseball (MLB). He previously played for the Los Angeles Dodgers. With the Dodgers, Gordon was primarily a shortstop. In 2015, in his first season with the Marlins, Gordon hit .333 for a total of 205 hits and stole 58 bases. He led the NL in all three categories and became the first NL player to lead the league in both batting average and stolen bases since fellow second baseman Jackie Robinson in 1949. On April 29, 2016, Major League Baseball suspended Gordon for 80 games due to performance-enhancing drugs use. He tested positive for exogenous testosterone and clostebol. Devaris Gordon was born in Windermere, Florida, the son of former Major League pitcher Tom Gordon and Devona Denise Strange. His parents were high-school sweethearts but did not marry; Tom had relationships with three other women as well and had a total of five children, all in Florida. Dee was his second-oldest. When Dee was six years old, his mother Devona was shot to death by an ex-boyfriend. Tom sued for custody of Dee and raised him with the help of his own mother, Dee's grandmother. Dee's half-brother, Nick Gordon, was drafted by the Minnesota Twins in the first round of the 2014 draft. Despite being Tom Gordon's son, the younger Gordon did not take up baseball until his high school years, having previously dedicated himself to basketball. He received a scholarship offer to play college basketball for the Louisville Cardinals. Gordon played baseball at Avon Park High School (like his father), Seminole Community College, and Southeastern University, all in central Florida. He was drafted by the Los Angeles Dodgers in the fourth round of the 2008 Major League Baseball Draft. In 2008, with the Ogden Raptors of the Pioneer League, he hit .331 in 60 games. With the Great Lakes Loons in 2009, Gordon hit .301 and stole 73 bases. He appeared in the Midwest League All-Star Game, was named the league's most valuable player, selected to its mid-season and post-season All-Star teams, and selected as its "Prospect of the year". The Dodgers also selected him as their "Minor League Player of the Year". In 2010, he was with the Chattanooga Lookouts in the Double-A Southern League and was selected to represent the Lookouts in the All-Star game but was unable to play because he was also selected to the All-Star Futures Game. He hit .277 in 133 games in 2010, while stealing 53 bases and committing 37 errors. He played for Gigantes de Carolina in the Puerto Rico Baseball League after the season. He was assigned to the AAA Albuquerque Isotopes at the start of 2011. At the start of 2011, he was the Dodgers' best prospect according to Baseball America. After an injury to shortstop Rafael Furcal, the Dodgers purchased Gordon's contract on June 6, 2011 and he made his major league debut in the top of the ninth as a pinch runner against the Philadelphia Phillies that night, and scored a run. His father was in attendance. The next day, in his first start, he had hits in his first three major league at bats and stole a base. 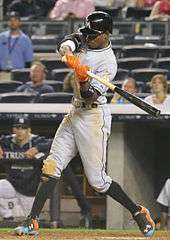 In a game against the Los Angeles Angels of Anaheim on July 1, Gordon stole second, third and home in the same inning. He became the first Dodger player since Harvey Hendrick in 1928 and the first Major Leaguer since Jayson Werth on May 12, 2009 to accomplish that feat. Gordon appeared in 56 games for the Dodgers, hitting .304 with 24 stolen bases. He also stole 30 bases for the Isotopes, giving him a total of 54 between the majors and the minors in 2011. In just 56 games for the Dodgers, Gordon's 24 stolen bases were tied for the most by a rookie during the 2011 season. He was selected to the Topps All-Star Rookie team. Gordon hit his first career home run on May 1, 2012, leading off the game against Jhoulys Chacín of the Colorado Rockies. On June 1, 2012, Gordon was part of a Dodgers lineup that featured the sons of five former Major Leaguers (along with Tony Gwynn, Jr., Iván DeJesús, Jr., Jerry Hairston, Jr. and Scott Van Slyke). This was the first time in Major League history that this had occurred. It was also the first time a starting infield of four major league sons had ever occurred: first baseman Van Slyke, second baseman Hairston, third baseman De Jesus and shortstop Gordon. Gordon was leading the league in stolen bases when he tore the UCL in his right thumb on a successful steal of third base on July 4 against the Cincinnati Reds. He did not rejoin the club until September 11, by which time the club had acquired Hanley Ramírez to play shortstop. With his starting spot gone, Gordon was relegated to a pinch running role the remainder of the season. Overall, in 2012, he played in 87 games and hit .228 with 32 steals. After the season, he played for the Tigres del Licey in the Dominican Winter League. He began 2013 back in AAA with the Isotopes and was called up to the Dodgers on May 4 after an injury to Ramírez. He played in 19 games, during which he hit a poor .175, and was optioned back to AAA. He rejoined the Dodgers late in the season and was used primarily as a pinch runner. He stole 10 bases in 12 attempts for the Dodgers in 2013 while hitting .231 in 38 games. Later in the season, the Isotopes started playing Gordon at second base and he played center field in the Dominican Winter League in an attempt to improve his versatility. Gordon beat out Alexander Guerrero to become the Dodgers starting second baseman for the 2014 season. He hit .301 in the first half of the season, while leading the league in triples (9) and steals (42) and he was selected to the National League squad at the 2014 Major League Baseball All-Star Game. At the All-Star game at Target Field, when Gordon was in the on-deck circle, Derek Jeter told Fox TV commentators how amazing it was to see Dee there, also playing as an All-Star, having first met him at age 15 when his father Tom was then pitching for the Yankees. Gordon had entered the game as a pinch-runner in the fourth inning, and scored the game-tying run. Overall, he went 0–1, but made a strong fielding play at second base, sliding to his right to grab a ground ball to end the sixth inning. Gordon finished the 2014 season with 64 stolen bases, the most in Major League Baseball. It was the first time a Dodgers player had led the Major League in stolen bases since Davey Lopes stole 77 bases in 1975. He hit .289 in over 600 at-bats and also led the league with 12 triples. He was selected as a Sporting News National League all-star. On December 10, 2014, Gordon was traded to the Miami Marlins, along with Dan Haren and Miguel Rojas, in exchange for Andrew Heaney, Chris Hatcher, Austin Barnes, and Enrique Hernández. Gordon recorded his 50th hit of the season in the Marlins' 28th game on May 7, 2015, tying Rogers Hornsby's 1924 Major League record for fewest team games required to reach 50 hits. After 28 games, Gordon led the major leagues with a .437 batting average. On May 22, Gordon stole four bases in a game against the Baltimore Orioles. In a June 30 home game against the San Francisco Giants, Gordon hit his first inside-the-park home run off pitcher Ryan Vogelsong, scoring 3 RBI. It was also the first inside-the-park homer at Marlins Park. He batted .333 for the season, winning the National League batting title and his first Rawlings Gold Glove Award. On January 18, 2016, Gordon signed a five-year contract extension with the Marlins worth $50 million. Gordon created "Flash of Hope", a charity to help children whose parent died as a result of domestic abuse. Working with the Florida District Attorney's office, he invites one child a month to join him in the clubhouse and during batting practice. ↑ "Marlins 2B Dee Gordon suspended 80 games after PEDs violation". espn.go.com. April 29, 2016. Retrieved April 29, 2016. 1 2 3 4 Nightengale, Bob (July 15, 2006). "Gordon ready to lead". USA Today. Retrieved January 7, 2015. 1 2 "Dee Gordon". Baseball-Reference.com. 2014. Retrieved January 7, 2015. 1 2 3 Spencer, Clark (September 21, 2015). "Miami Marlins' Dee Gordon honors his mother on field". Miami Herald. Retrieved September 22, 2015. 1 2 Lauber, Scott (May 30, 2008). "Flash: The Next Generation". Delaware Online. Retrieved January 7, 2015. ↑ "Nick Gordon". Baseball-Reference.com. 2014. Retrieved January 7, 2015. ↑ "Marlins celebrate first win of season with a slam dunk!". NY Daily News. Associated Press. April 11, 2015. Retrieved 21 April 2016. ↑ Lindner, Matthew (June 24, 2009). "Notebook: Gordon follows in dad's footsteps". Minor League Baseball. Retrieved August 27, 2013. ↑ "Gordon named MVP, top prospect". Losangeles.dodgers.mlb.com. May 24, 2013. Retrieved August 27, 2013. ↑ "Dodgers name top Minor Leaguers". Losangeles.dodgers.mlb.com. Retrieved August 27, 2013. 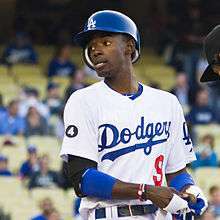 ↑ "Dee Gordon Named Dodgers Top Farmhand". Baseballdeworld.com. October 3, 2009. Retrieved August 27, 2013. ↑ Perrotto, John (December 4, 2009). "Los Angeles Dodgers top 10 prospects". Baseballamerica.com. Retrieved August 27, 2013. ↑ Nicholson-Smith, Ben. "Dodgers Designate Gibbons, Castro For Assignment". MLBTradeRumors.com. Retrieved June 6, 2011. ↑ "Los Angeles Dodgers vs. Philadelphia Phillies – Recap – June 06, 2011 – ESPN". Scores.espn.go.com. June 6, 2011. Retrieved August 27, 2013. ↑ "Gordon gets his stolen-base trifecta". Espn.go.com. Retrieved August 27, 2013. ↑ "Dee Gordon of the Los Angeles Dodgers voted winner of the Gillette presents National League Rookie of the Month Award for September | dodgers.com: Official Info". Mlb.mlb.com. Retrieved August 27, 2013. ↑ Hernandez, Dylan (June 3, 2012). "Dodgers again will be limited financially in amateur draft". Los Angeles Times. Archived from the original on June 6, 2012. Retrieved June 6, 2012. ↑ Hernandez, Dylan (October 29, 2013). "Dodgers' Dee Gordon to play center field in Dominican winter league". LA Times. ↑ Stephen, Eric (July 6, 2014). "Clayton Kershaw, Yasiel Puig lead 4 Dodgers named to All-Star team". truebluela.com. Retrieved July 6, 2014. ↑ Hoornstra, J.P. "Dodgers' quartet sees mixed results in All-Star game.". Inside the Dodgers. J.P. Hoornstra/Word Press. Retrieved July 16, 2014. 1 2 De Nicola, Christina (February 16, 2015). "New Marlins 2B Dee Gordon motivated by breakout '14, offseason trade". Fox Sports. Retrieved February 16, 2015. ↑ "Sporting News 2014 National League All-Star team". Sporting News. October 22, 2014. Retrieved October 22, 2014. ↑ Gurnick, Ken (December 11, 2014). "Dodgers adding Kendrick, Rollins in trades". MLB.com. Retrieved December 11, 2014. ↑ "Marlins by the numbers: Gordon reaches 50 hits". ESPN. May 8, 2015. Retrieved May 9, 2015. ↑ Spencer, Clark (May 8, 2015). "Dee Gordon, Dan Haren already paying dividends for Miami Marlins". Miami Herald. Retrieved May 9, 2015. ↑ "Video: Gordon's four-steal game". MLB.com. May 22, 2015. Retrieved May 24, 2015. ↑ De Nicola, Christina (30 June 2015). "Dee Gordon legs out first inside-the-park HR at Marlins Park". Fox Sports. Retrieved 1 July 2015. ↑ Miller, Doug (November 10, 2015). "Defensive standouts nab Gold Glove Awards". MLB.com. Retrieved November 10, 2015. ↑ "Marlins make Dee Gordon's 5-year extension official". ESPN.com. January 18, 2016. Retrieved January 18, 2016. ↑ "Dee Gordon paid tribute to José Fernández by batting from the right side of the plate, then he homered". Major League Baseball. September 27, 2016. Retrieved September 27, 2016. ↑ "After honoring Jose Fernandez, Dee Gordon hits home run". USA Today. September 27, 2016. Retrieved September 27, 2016. ↑ "Dee Gordon, Marlins' Tearful Salute to Jose Fernandez Is Transcendent MLB Moment". Bleacher Report. September 26, 2016. Retrieved September 27, 2016. Wikimedia Commons has media related to Dee Gordon.